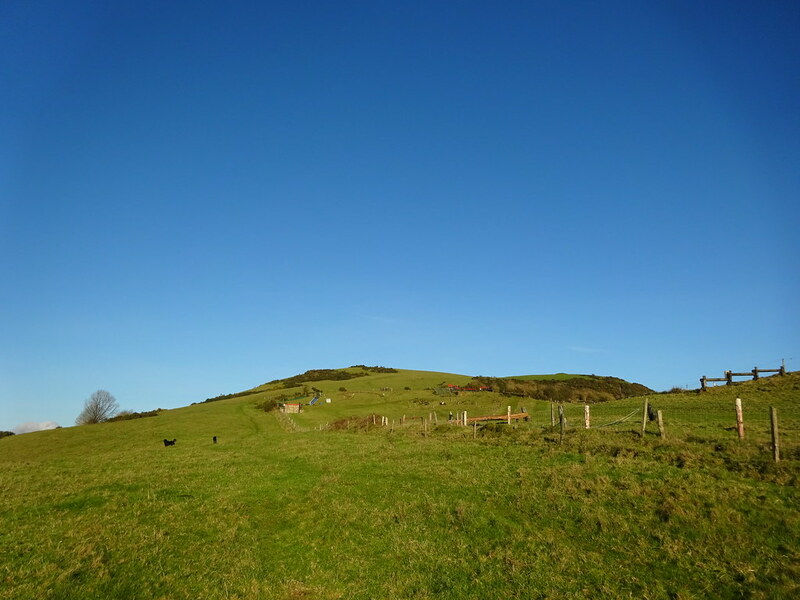 Last weekend I revisited one of my favourite small hills, Croghan Hill. 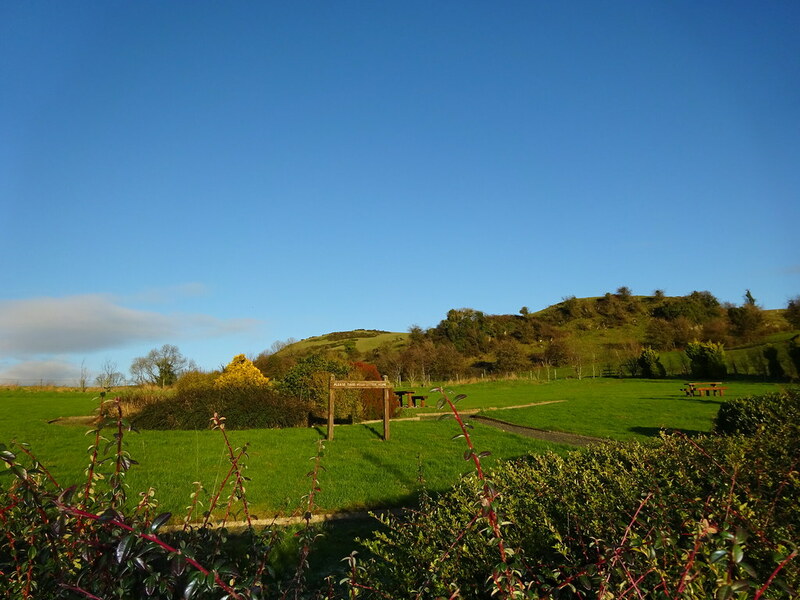 It is situated on the road between Tyrellspass and Rhode, just inside the Offaly border. 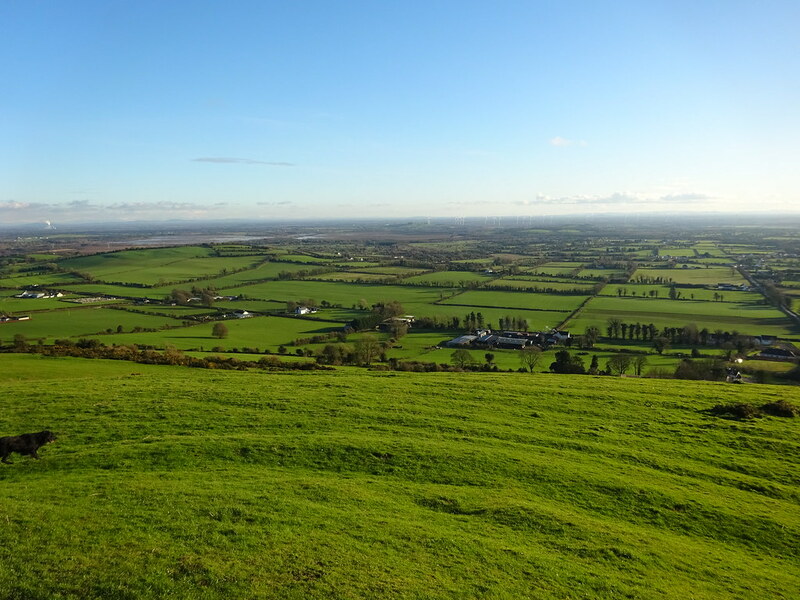 Long noted as one of Ireland’s most isolated hills, it stands in an idyllic location, in the middle of a vast and almost totally flat plain of farm and bogland, and boasts extensive views in all directions. My walk started in the car park of the local community centre, at the foot of the hill. 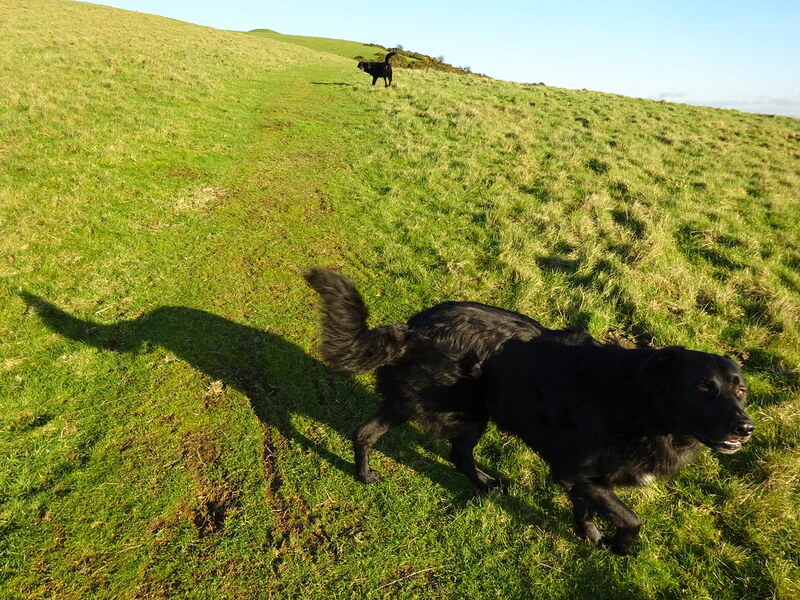 On parking my car, I was greeted on arrival by two large but remarkably enthusiastic and friendly black dogs, who proceeded to lead me up the hill, first through the small garden to the rear of the Community Centre, and then onto the hill itself. From there it was a short walk (around 650 metres) uphill, with the Cloghan Challenge assault course on my right, and the dogs in front. The dogs kept a close eye on me to ensure I stayed on track. Before I knew it, I was at the summit, which is topped by an elevated mound. 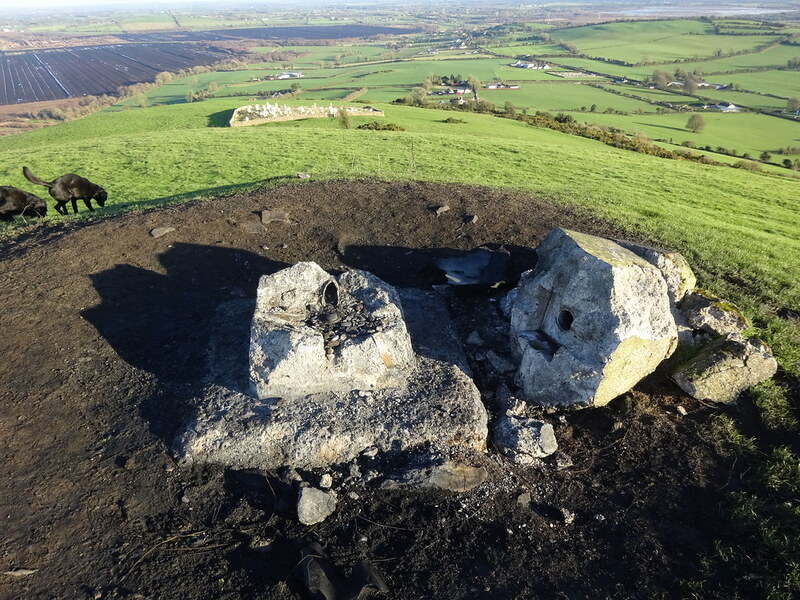 It was there that I was shocked to see the state of the trig pillar, which was destroyed almost beyond recognition. Beside it lay the remains of a large burned-out tyre, presumably from a truck or similar large vehicle, a small maze of wires, and charred earth, the tell-tale after-effects of a fire. The sight of the destroyed trig pillar made a pitiful contrast to my last visit there, last Spring. Thankfully the views further afield from the summit were as majestic as ever, on an ideal afternoon for distant panoramas. I then ventured downhill towards the tiny ancient cemetery a short distance to the east. 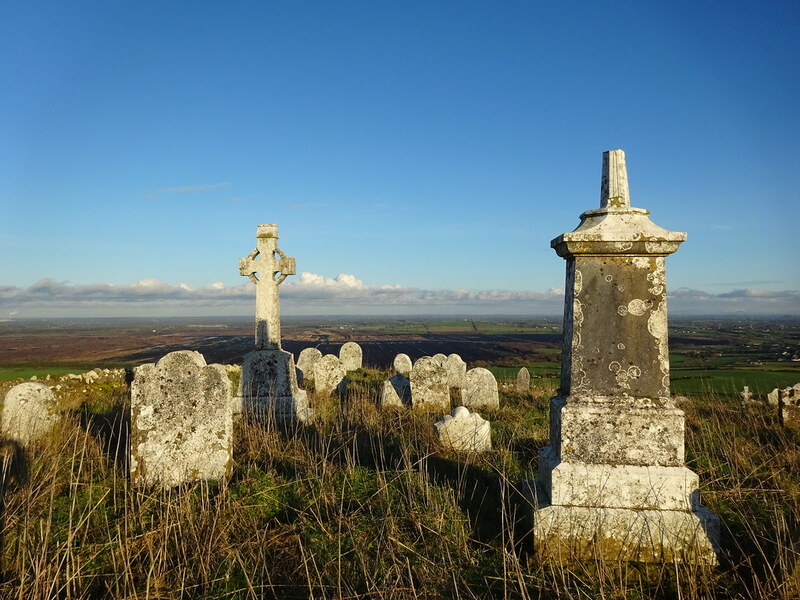 The atmospheric cemetery was certainly worth visiting, with an eclectic range of weatherbeaten headstones inside a sturdy stone wall, and accessible by a primitive stone stile. Returning to the summit, I again surveyed the smashed trig pillar and savoured the views further afield. The short journey downhill was very enjoyable. 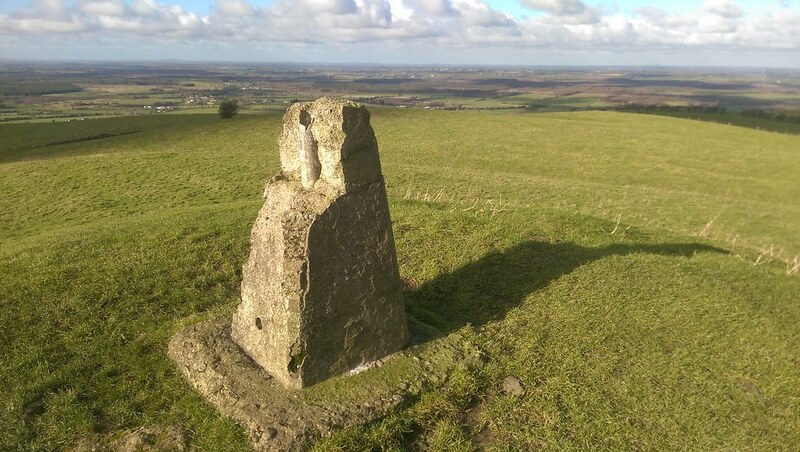 Although I’m no expert on the subject, I’d be surprised if the destroyed trig pillar here is ever replaced as trig pillars generally have outlived their original purpose in mapping and surveying. 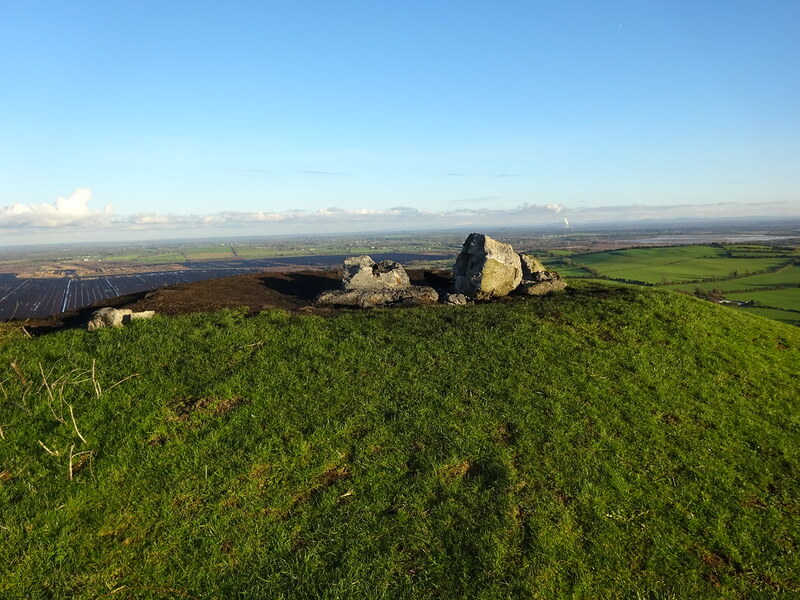 Sadly, this is likely to be the end of an era for generations of walkers on Croghan Hill, and visits to its summit will never be quite the same again. What a joy it would be to walkers everywhere if the surviving hilltop trig pillars around Ireland could be preserved and restored if necessary as national monuments! This would both commemorate their historic function as Ordnance Survey network stations, and recognise their more recent role as a beacon and guide for walkers and sightseers. 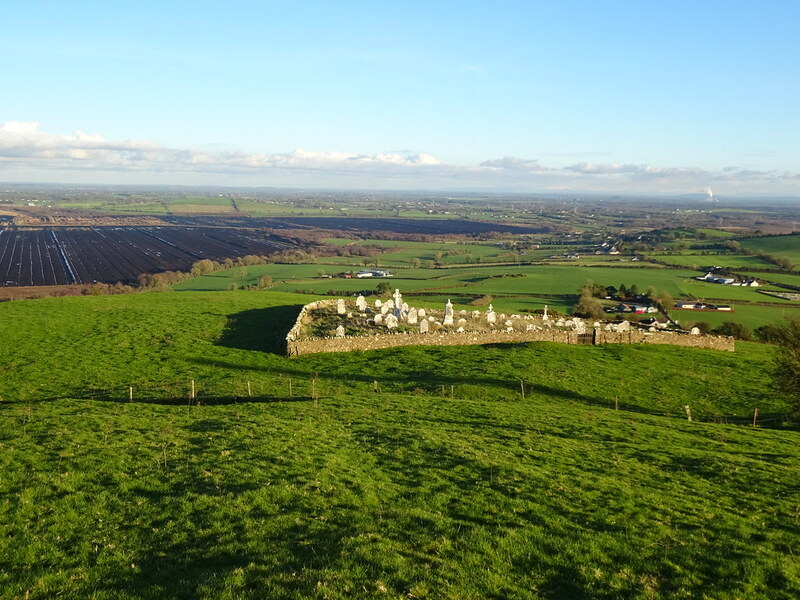 If the mindless vandalism on Croghan Hill prompts such an initiative, some good will have come from it.